Though some safety improvements still remain to roll out in Roslindale Square, especially regarding the relocation of certain bus stops, the final condition has come into clear focus recently with the installation of flexposts to help delineate and reinforce the paint that was put down by our friends at BTD in the late spring/summer. Now that the dust is partially settling, this seems like a good time to explain what has been installed and why. 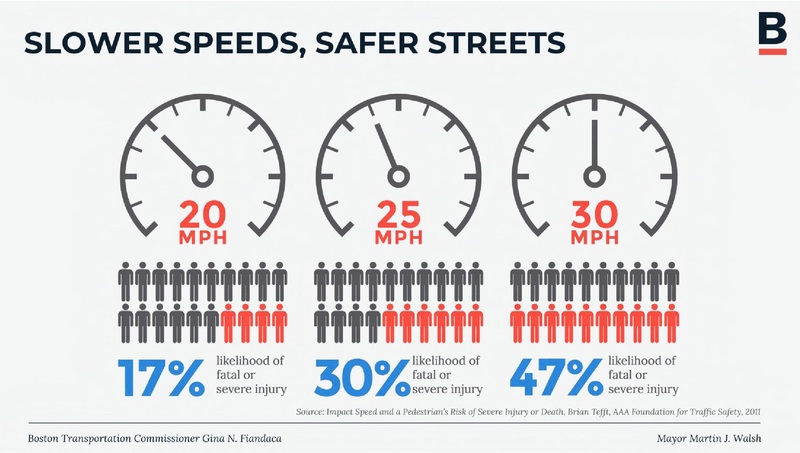 This is why slowing vehicle speeds is such an important part of the city’s Vision Zero program that aims to eliminate fatal and serious traffic crashes on Boston’s streets by 2030. 2. The fundamental basis of traffic calming. The way to slow vehicle speeds is two-fold: First, set the speed limit to the speed you want motor vehicles to go. While a citywide 25 mph default speed limit isn’t perfect, it is clearly better than the 30 mph limit we previously had for decades. Second, redesign every street to provide the physical and visual cues needed for drivers of motor vehicles to slow down and meet that speed limit. Note that we didn’t mention enforcement here. That’s because we can’t really rely on close enforcement long-term in any location (BPD has a lot on its hands) and enforcement carries with it its own concerns about equity. An analogy that is often made in this context is to the incredible strides in airline safety that have occurred over the last couple of decades, to the point where you can count on one hand the number of fatalities on U.S. commercial airlines in that period. This success has come largely from treating every single crash as worthy of investigation and analysis and then making systemic changes based on the conclusions drawn every time. We know slower vehicle speeds will lead to fewer fatal and serious crashes. Everything we do to slow vehicles makes us all safer. flexposts to physically reinforce these improvements. Flexposts have been around a long time, but have recently become the go-to way to provide inexpensive yet fast, effective safety improvements. Note that they can be driven over by emergency vehicles if necessary. Finally, an additional measure that the current plans do not do enough to implement is real, protected cycling infrastructure to further reduce the priority given to motor vehicles and provide meaningful alternatives to those wanting to travel by bicycle. In-street bicycle lanes are present on parts of Washington, South, and Corinth, but they quickly devolve to sharrows, which may (unfortunately) do more harm that good. Much more is needed. Crosswalk daylighting on South, at the connection between the municipal parking lot and the area leading to the Village Market. Flexposts on the curve at South/Poplar help shorten the crossing distance and clarify that this is a single lane approach that widens only after the crosswalk. Flexposts again delineate the single-lane approach on South, reinforcing the yield required of drivers coming from Washington and once again shortening the crossing distance. Tragedy leads to clarity in South Boston…and maybe citywide? Everyone concerned about traffic violence in Boston, which touches every part of our city, every day, day-in, and day-out, felt incredible sadness at the tragedy late last month in South Boston in which a crash on L Street between reckless drivers resulted in one of them driving onto the curb and killing a 3 year-old boy and injuring his sister. There have been similar tragedies around the city over the years, taking both the young (such as the 5-month old girl killed on Humboldt Street in Roxbury a couple of years ago) and the elderly (such as one of our own neighbors here in Roslindale in 2016) and everyone in between. For whatever reason, perhaps because with Vision Zero as the city’s adopted policy for the last several years, we all have a better collective vocabulary and understanding that these crashes constitute a form of traffic violence that degrades our public spaces and puts us all under threat every time we venture out onto our streets, this tragedy seemed to hit a particularly raw nerve. 4-way stop signs along _________ and relevant locations throughout ________. Additional posting of Speed Board Signs on high traffic roads throughout _________ for feedback to reduce speeds. Blinking Pedestrian Crossing signs at high traffic areas like we have on _____________. Bumping out our sidewalks at crosswalks on ___________, school zones and elsewhere to shorten crosswalks, make stop signs more visible & narrow our streets to encourage slower speeds. Road Diets on ___________, one lane from ____________, and speed humps in appropriate locations. More delineators in high traffic areas reminding drivers to stop for pedestrians; paint in the roads advising drivers to slow, yield and stop. Last year, hundreds showed up at the BTD Budget Hearing, and it had a direct impact on securing more funding for the Neighborhood Slow Streets program. It’s critical to keep the momentum going in 2018, so please show up and support the proposal! WalkUP also submitted an additional support letter today in anticipation of the hearing, which we will deliver in person tonight. The full text of the letter is included below. As part of the Mayor’s Vision Zero Boston initiative, Boston Public Works will make some significant pedestrian infrastructure improvements in the village this coming week, beginning Tuesday, April 24. 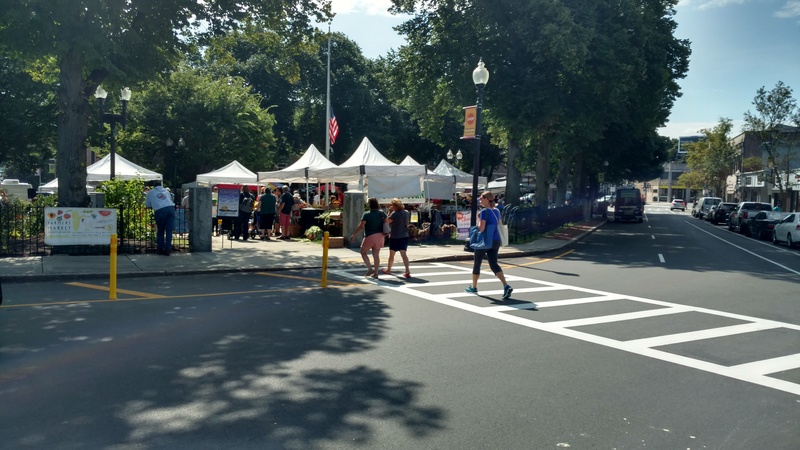 We are extremely excited to be officially entering “Phase I” of this process, and appreciate the City’s efforts in engaging with WalkUP and the community at large to help advance our vision of making Roslindale the most walkable neighborhood in Boston. The safety upgrades we will see this week were set in motion, at least in part, by our neighborhood Walk Audit back in 2015. In particular, much of the Square will be re-paved and re-painted this week. If all goes according to plan, we will see two new crosswalks corresponding to some well-tread desire lines — one at the bottom of the steps coming down from the commuter rail station, crossing Belgrade Ave, thus creating a straight shot pedestrian route from the T to the soon-to-open (can’t wait!) Distraction Brewing Company at the corner of Belgrade and Birch (previously Emac and Bolio’s as well as the Select Café space). Another new crosswalk should appear connecting the Taft Hill municipal lot to the Village Market area, crossing South Street mid-block between Taft Hill and Belgrade. 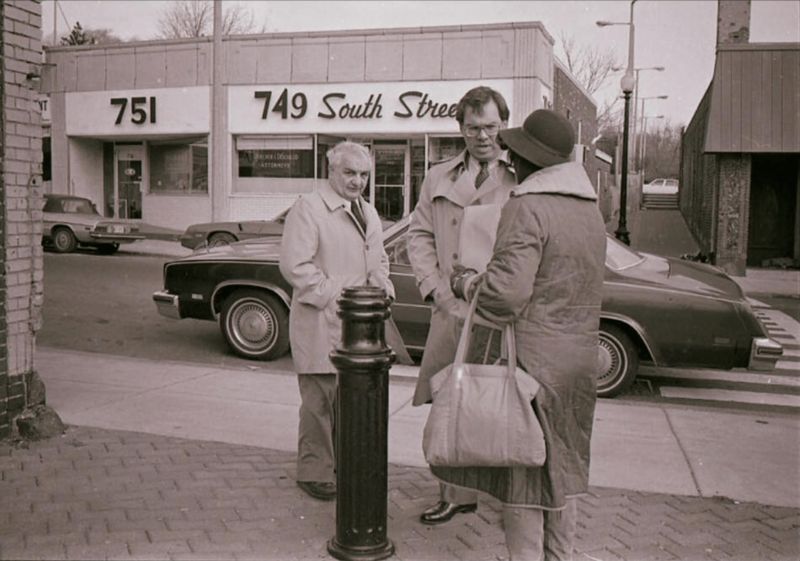 Indeed, this archival photo (perhaps from the mid-1980’s, showing then-City Councilor Thomas Menino across from now-753 South Street) shows that we once had a crosswalk here, so it’s great to get it back! Particularly exciting is that we will also be getting our first raised crosswalk in the village, at the corner of Belgrade and Birch Street. We expect most of this work to happen late and overnight. While this may be a short-term noise hardship for those living nearby, it means the work will be done much faster — with cooperative weather and no unpleasant surprises, hopefully in less than a week. We support the City’s decision to get this work done quickly, which will allow us to enjoy the benefits quite soon and also minimize daytime impact on village businesses. Earplugs can be purchased at Sullivan’s Pharmacy for pennies a pair! 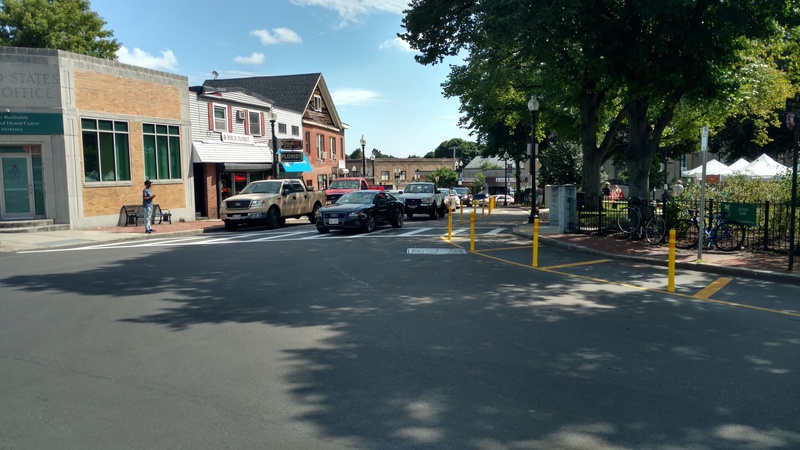 Part of this “Phase I” effort also involves improving the locations of the village bus stops and installing flexposts to better protect “daylighted” areas. For various logistical reasons, these steps will roll out as “Phase I(b)” — not this coming week, but (we hope) in the very near future. Stay tuned for more info on this front. With yesterday’s announcement by the Mayor’s Office and the Boston Transportation Department that BTD’s requested budget will be increased by $5 million annually starting in FY 2019 (i.e., July 1 of this year), we can all now safely say that the implementation of Vision Zero and Go Boston 2030, the major mobility policy and plan that took the better part of the administration’s first term to develop and adopt, has begun in earnest. 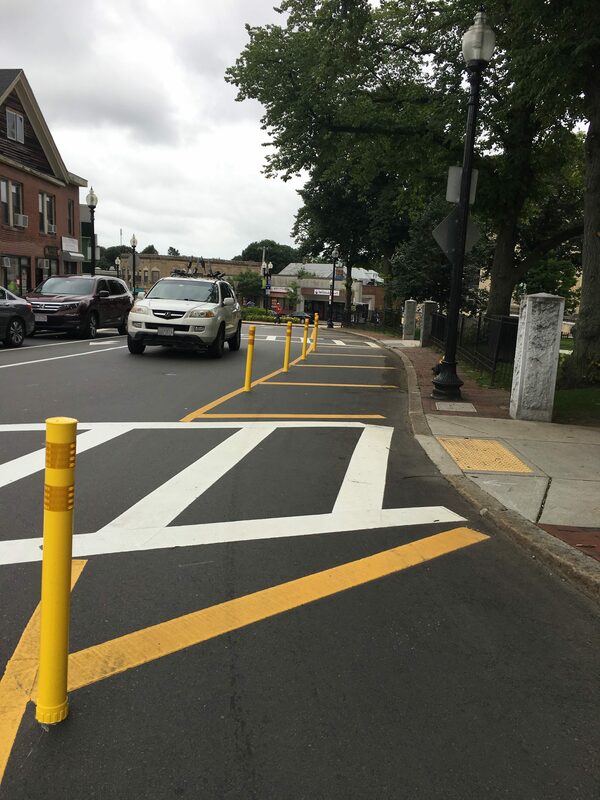 Up to four new maintenance & operations personnel to ensure that infrastructure added to improve street safety, such as pedestrian delineators and flex posts, are kept in a state of good repair. All of that new dedicated staff should be music to anyone’s ears who was concerned that the combination of Vision Zero and Go Boston 2030 were more ambitious undertakings than BTD had staff or resources to implement. It is now clear that the Mayor and his administration intend to make good on the promise the policy and plan embody. He and they are to be applauded and thanked for taking this important step. We here at WalkUP Roslindale look forward to supporting the budget request before the City Council and then doing everything we can to help the Mayor and BTD implement both Vision Zero and Go Boston 2030 in our neighborhood. We recommend that you do the same! 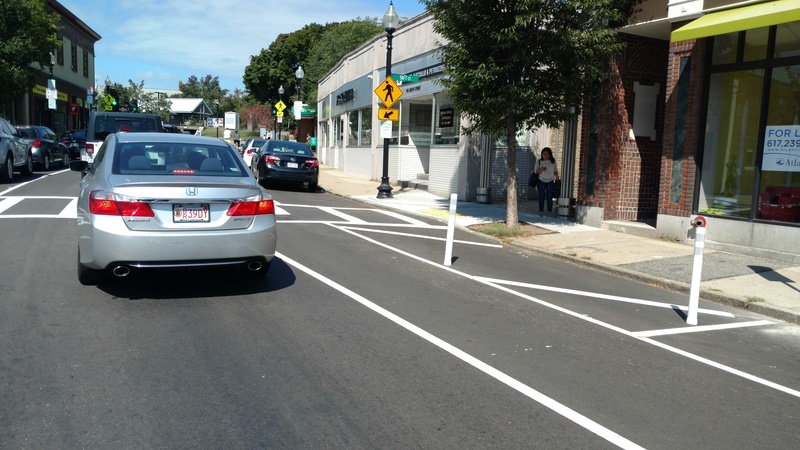 WalkUP Roslindale is an enthusiastic member of the Massachusetts Vision Zero Coalition. The Coalition is largely comprised of tax-exempt non-profit organizations or informal associations like WalkUP Roslindale, and does not endorse candidates. We do, however, want to find out where candidates stand on key walking, biking, and transit issues, and to that end distributed a survey to all official candidates in Boston, Cambridge, Somerville, Springfield, and Lynn to give them a chance to weigh in. The results were made public today. Rozzie residents should be particularly interested to see the survey results for the Boston Mayoral Candidates, the City Council At Large Candidates, as well as for District 4, District 5, and District 6, all of which at least touch on our neighborhood. If you like your candidates’ responses, let them know–and if they didn’t respond, or you see room for improvement, let them know that as well. With elections coming up soon on Tuesday, November 7, 2017, it’s time to start paying attention! It’s been a long time that this particular set of changes has been in the works. But it sounds like Stonybrook’s Neighborhood Slow Streets improvements will go in next month. Pre-construction meeting to be hosted by BTD/PWD scheduled for Friday, August 25 at 6-8 pm at Curtis Hall in JP (20 South Street). It will be really good to have slow street improvements actually put on the ground in this city so we can all go see what they’re like and share with our neighbors. On May 16th, 2017, City of Boston Mayor Marty Walsh was interviewed on WGBH radio. In the wake of the recent fatal hit-and-run crash that killed Rick Archer on Comm Ave and an uptick in pedestrian fatalities in Boston and nationwide, Mayor Walsh urged people who walk and bike in the city to take more personal responsibility. Mayor Walsh said that residents were placing too much blame on his administration to solve the problem. The following is the Vision Zero Coalition’s letter to the Mayor in response to his comments. WalkUP Roslindale is a Coalition member. Which is why we were dismayed by your comments Wednesday afternoon on WGBH Radio. On behalf of the Massachusetts Vision Zero Coalition we invite you to work with us to fully fund and implement Vision Zero in Boston. We ask that you join us on Friday morning at 8 AM for a moment of silence for victims of traffic violence on City Hall Plaza. On behalf of those victims, we also ask that you apologize for the comments you made on the air. Our streets are in crisis. In 2016, fifteen people died while walking on Boston’s streets; a record-breaking high for pedestrian fatalities. We are on track to see even higher numbers in 2017. Crashes overall are up. On average, at least two to three people walking are hit in a crash that results in an EMT call every day. We need action from you and your administration, not victim-blaming. When you said on the air, “Pedestrians need to put their head up when they’re walking down the street, take your headphones off … you’ve got to understand, cars are going to hit you,” you were reiterating a narrative that doesn’t stand up to the crash data your administration collects. Most of the people killed while walking were children or older adults. In 2016, of the 10 pedestrian victims whose ages we know, four were older than 60 and two were younger than 3 years old. This Coalition and your constituents look to you for action. A week ago, hundreds of people attended the City Council’s FY18 budget hearing for the Boston Transportation Department to call for increased resources to make streets safer for everyone. After the hours of questions from the council and public testimony, it’s clear from all sides – Boston is falling behind. In your interview with WGBH, you said that the city is doing “everything we can,” but we know Boston is being eclipsed by peer cities in both resources and implementation. The City of New York spends about $20 per person on Vision Zero annually, and San Francisco spends $75 per person annually. Both cities have seen declines in overall traffic fatalities despite a troubling rise in fatal crashes nationwide. Boston is spending less than $5 per person, this is not enough. Forty-seven neighborhood groups applied for Neighborhood Slow Streets, a signature program of Boston’s Vision Zero initiative. Your FY18 budget recommendation only provides resources to implement two to three in the coming year. At the current rate of implementation it will take more than 20 years to respond to just the first round of applications. Safety should not be a privilege afforded to only some Boston neighborhoods. We recognize that there are many competing budget priorities and that rapid change on our streets will cost money. This year we suggest drawing on the parking meter fund. In the long term, we are here to work with you to diversify and increase the revenue streams available for transportation, for example through increased parking revenues. Simply put, the Massachusetts Vision Zero Coalition, and the thousands of people we represent, feel strongly that the 2018 transportation budget as currently proposed is insufficient to reduce the number of fatalities and serious crashes on our streets. We hope you will take this opportunity to recommit to leading Boston as a Vision Zero city. Despite inclement weather, we had a good turnout for Monday night’s Slow Streets info session. For anyone who was unable to make it, please check out the slides from the presentation.. Let’s put Rozzie on the map as the next neighborhood to take this important step toward Vision Zero! Neighborhood Slow Streets — They’re coming, so learn about how to participate! 2/13/17 storm update: note changed location to 20 Belgrade Avenue! On Monday, February 13, 2017, at 6:30 pm at 20 Belgrade Avenue, Unit 7 (2nd Floor) the Roslindale Community Center (Washington St & Cummins Hwy), WalkUP Roslindale will host a community organizing and informational workshop on the Boston Transportation Department’s new program on Neighborhood Slow Streets and how our neighbors throughout Roslindale can come together and go about preparing for and applying to become part of the program.